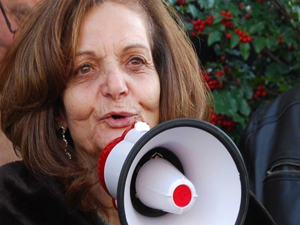 The defense team for Chicago Palestinian community leader, Rasmea Odeh, have uncovered new evidence that confirms her alleged immigration fraud case is based on her being targeted for Palestine activism. Yesterday, they filled a motion to dismiss the indictment against her. In the Chicago courtroom on the day of her arrest, Assistant U.S. Attorney Barry Jonas was seen conferring with the prosecutors. At the time, that was the first clue Odeh’s indictment was related to the case of the well-known Palestinian and anti-war Midwest activists whose homes were raided by the FBI when the U.S. attorney alleged that they had provided material support to foreign terrorist organizations in Palestine. Eventually a total of 23 activists were subpoenaed, but all refused to testify and were never charged assuming because of a lack of evidence. Members of multiple organizations were also targeted including the Anti-War Committee in Minneapolis, Freedom Road Socialist Organization, Arab American Action Network (AAAN), Palestine Solidarity Group – Chicago, and others. Assistant U.S. Attorney Barry Jonas continues to lead this ongoing investigation. Odeh’s supporters could easily presume that Odeh and the case of the 23 were related. Hatem Abudayyeh, Executive Director of the AAAN and one of the activists whose home was raided by the FBI, is also a colleague of Odeh, Assistant Director of the AAAN. It’s important to note that this ongoing investigation involves activists from multiple struggles including the anti-war movement, Colombia, Cuba, and immigration rights, but it’s primary focus is support for Palestine. Echoing what’s happening to Odeh now, Carlos Montez, a veteran Chicano, anti-war, and immigrant rights activist, whose name appeared on a search warrant of the Anti-War Committee office in Minneapolis, was indicted in May of 2011 on unrelated charges related to a protest 45 years ago. The charges were eventually thrown out of court. This multi-year investigation that involves targeting social justice movements, in this case Palestine activism, by criminalizing their activity and suppressing any coalition building among different groups has been a trend throughout U.S. Justice Department and FBI history. More on this trend later. These are dots that are not difficult to connect. The initial investigation in 2010 broadly targeted activists throughout the Midwest, but primarily focused on Palestinians and Palestine activists in Chicago. During the last four years, the Palestine solidarity movement has grown in numbers and impact particularly through the growth of the Boycott Divestment Sanctions (BDS) movement directed at Israel and the proliferation of Students for Justice in Palestine groups on college campuses. With the growth of the movement came the attention of the FBI. As mentioned above, the FBI has a history of targeting growing social justice movements in the U.S., criminalizing those movements, and preventing coalitions they might form with other communities or organizations. Examples from Church Senate Committee Report on FBI Counterintelligence (COINTELPRO) Programs and other studies of FBI history include Dr. Martin Luther King, Jr. and the Southern Christian Leadership Conference (SCLC) accused of being communists and the undermining of attempted coalition building with unions and anti-Vietnam war groups; the Black Panther Party prevented from building coalitions with the Students for a Democratic Society (SDS) and politicized gangs like the Blackstone Rangers in Chicago; and the targeting of the Sanctuary Movement that supported Central American refugees in the 1980s accusing activists of supporting terrorists as a way of undermining the movement’s broad support of faith-based, human rights, and socialist groups. Several hundred statements of support from unions, human rights, civil rights, and faith-based groups and thousands of supporters from across the country for the 23 anti-war and Palestine activists seem to have prevented indictments in that case so far. It is not hard to imagine the prosecutors reviewing the evidence they had collected that had failed to convince a grand jury for an indictment, finding Odeh’s file from the Israelis, and deciding to build a case for indicting another leader of Chicago’s Palestinian community. There are few other reasonable explanations for why Odeh would be charged for an alleged offense that occurred 20 years ago on the basis of a prison term resulting from a confession obtained through torture 45 years ago. “Rasmea is facing up to ten years in jail and deportation. She is a Palestinian who has stood up for the Palestinian, Arab and Muslim community in Chicago, and to end the occupation of Palestine as well. Rasmea suffered vicious torture and sexual abuse in Israeli prisons, and the U.S. government is trying to victimize her again,” states Hatem Abudayyeh of the national Rasmea Defense Committee. Odeh’s defense team will be discussing this motion to dismiss at her next court hearing on September 2 in the United States District Court for the Eastern District of Michigan, at 231 W Lafayette Boulevard, in Detroit, Michigan. The Rasmea Defense Committee and the Committee to Stop FBI Repression (CSFR) – CAIR-Chicago is a member of both coalitions – are organizing a picket line outside the court building at 2:00 p.m. and filling the courtroom for the hearing beginning at 3:00 p.m.
You’re not anti-Semitic, racist or a self-hating Jew for disagreeing with Israel, just a person of conscience, morals and a good heart.